Wolves striker Liam McAlinden is hoping for more opportunities after making an encouraging return to Molineux from two months on loan with Shrewsbury Town. Wolves brought McAlinden on at half-time on Saturday when they were a goal down to MK Dons. They ended up losing 2-0, but the 20-year-old did enough to catch the eye. "I had chances. I didn't take them but they weren't too far away. If I keep playing, hopefully they'll keep coming and I'll do well," he told BBC WM. Having represented Northern Ireland at youth levels, McAlinden was called up by their Under-21 squad, only to switch his allegiance to the Republic of Ireland, for whom he qualifies through his parents. 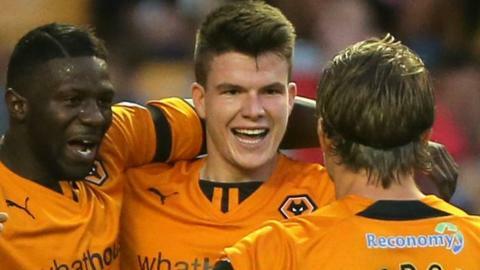 Having scored the first senior goal of his career on his full debut in Wolves' Johnstone's Paint Trophy win over Walsall back in early September, McAlinden also netted on his Shrewsbury bow, and went on to hit a total of three goals in nine appearances for the Shropshire club. Two of those three goals came as a substitute, a role former Northern Ireland youth international filled again when he was introduced after the restart on Saturday. It was part of a double switch which saw top scorers Leigh Griffiths and Bakary Sako taken off and although Jackett also has the options of Bjorn Sigurdarson and Jake Cassidy, Cannock-born McAlinden's greater match fitness at League One level should keep him in contention for Saturday's trip to Rotherham. "I was ready for my chance," added McAlinden. "I've been scoring for Shrewsbury recently so I'm not lacking in confidence. "The gaffer's recalled me from Shrewsbury and wanted me to come in and score goals and I'm confident I can do that if I get the chances. "I played nine straight league games for Shrewsbury and enjoyed my time there. I've played a lot of Under-21 football at Wolves and I'm used to playing at a high standard, but it was a lot more physical."